If you have been following Bare Feats for any length of time, you know we love to test out new products. Therefore, it is not unusual to be contacted entrepreneurs who want me to try their new invention. I've decided to feature three that I've encountered recently. Do you have an LED on your Mac or DVR or other device that's keeping you awake at night? Wish you could dim it? I have a DVR in the bedroom that's been bugging me. My first solution was to put objects in front of it. But when I tried to access the DVR with the remote, I'd have to get out of the warm bed to remove the object. Jason Hampton sent me a sample of his invention, LightDims. They are peel-off pieces of film in various shapes and sizes that you place over the LED display. It dims the light but allows you to still read the display. Think of them as "sunglasses" for LEDs. Simple, inexpensive, and effective. They certainly solved my DVR issue. I love my iPad 2 with the Smart Cover. But when I'm on the move, I'm concerned about protecting the backside of the iPad. And since I have the black leather Smart Cover, it would be nice if I could find a black leather sleeve that would protect it. Dave Munson, a friend of my nephew, contacted me about his company that produces various leather products. Like the engineers at Apple, his company seeks to create products they themselves would use. He sent me a couple of samples. The one that excited me the most was the Gadget Pouch (aka iPad sleeve). The iPad 2 with the Smart Cover fits in it perfectly and is protected whether being carried under my arm or in my unpadded messenger bag or shoved in the webbing behind the front seat of my MINI. It comes in various colors (including my favorite, black). I'm sold. They have an iPad 2 Case that can be used to prop up your iPad. Check out the briefcases, backpacks, messenger bags, and other leather products on their website. Rich Ford, a friend of Jason of LightDims, sent me a samp le of the PockeTowel. It's a workout towel with dual zippered pockets. I gave it a test drive in our condo's gym. I don't like to have anything in my gym clothing pockets when I work out. Nor do I want to place my keys and iPhone in an insecure location. 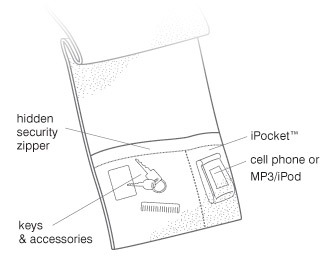 With the PockeTowel, I was able to put my keys in one pocket and the iPhone in the other pocket. They both remain safe and secure while I workout and listen to tunes on my iPhone using my Bluetooth headphones. "Zhu" is the Chinese word for "bamboo." I recently discovered the joys of socks made from bamboo. I like the fact that the PockeTowel is made with cotton and bamboo fibers.�It's soft and absorbant. I'm planning to test drive it when I play tennis with my nephew. If you have comments or questions, email . You can also subscribe to the subscribe to our RSS feed or follow him on Twitter @barefeats.